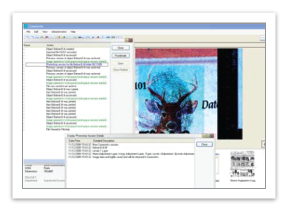 CaseWorks DEMS (CWS) is a secure digital evidence management and comparative analysis software and is the platform for an extensive suite of forensic analysis software modules. CWS is designed to be extremely configurable and provides the granular security, customizable data gathering, image acquisition/enhancement and automated reporting needed to meet the ever evolving standards of ISO, SWGIT, SWGFAST and ASCLD. CaseWorks offers a familiar and flexible structure configurable to your agency’s asset management needs. Configure the software’s features to best meet your agency’s workflow. Features include: asset acquisition, tracking, authority settings, field set administration and naming policies. (Compatible with Microsoft SQL and Oracle. 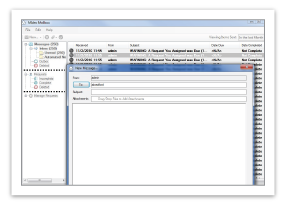 The CaseWorks database links custom information to a user, folder, or individual file. Users can search this data to find relationships between assets that reside in different cases or across different years. 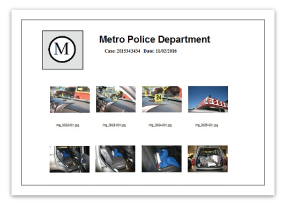 The Comparative Analysis module provides extended tools for those performing latent print, footwear, questioned documents, impression evidence, or any forensic comparison application. Tools include: 1:1 on-screen and print calibration, image enhancement/rotation, charting tools, measurement, overlay and transparency adjustments. All of these tools are designed specifically for the forensic analyst/examiner. They are easy to use and require much less training/experience for performing the core functions than other professional-grade graphics programs. CaseWorks insures that the integrity of all case related digital assets are secure. User authority levels are flexible and can be configured to provide either group or user access rights. This makes it easy to set up and enforce agency policies without micro management and constant user supervision. A complete set of administrative controls allow agency security policies to be set up and enforced. 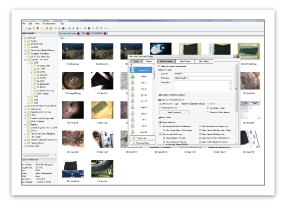 Control access at the group or user level or apply it to specific images or folders. Further, a comprehensive set of feature authorities allows administrators to specify features that individual groups or users can access. For users who want to perform advanced image enhancements, a direct interface to Adobe Photoshop™ is available as a plug-in to CaseWorks. 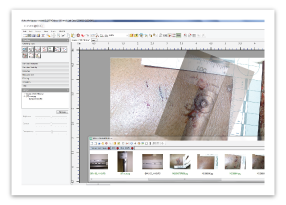 Photoshop™ launches directly from CaseWorks and imports selected images from CaseWorks database with all of the Photoshop™ history and metadata intact. 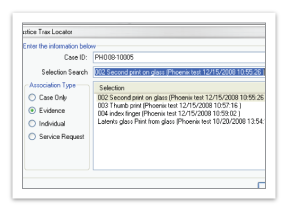 The CaseWorks LIMS Connect module provides a direct interface to a forensic Laboratory Information Management System. This module allows CaseWorks to communicate directly with the LIMS to retrieve information from the LIMS tables. CASEWORKS constructs a mirrored structure of your LIMS database, keeping the database structure the same. 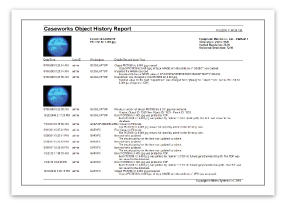 Low resolution copies of images are sent from CaseWorks to the LIMS “as needed” for documentation purposes. When an asset is imported into the database, CaseWorks verifies that the imported item is the same as the item in the database using hash sums. CaseWorks tracks image versions, automatically linking a modified image with its unalterable original, regardless of how many changes occur. Image history can be automatically printed or converted to a pdf file via built-in reports. 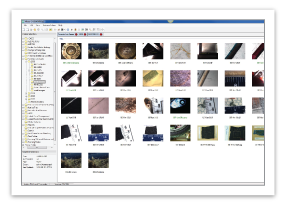 CaseWorks enables users to “mine” information for meaningful correlations in image information. Upon submission to the database, images and folders continuously generate and track history, field set and metadata information (department, time/date, photographer. etc.) that can be queried across cases, years, users or any other criteria. Various search functions are available. 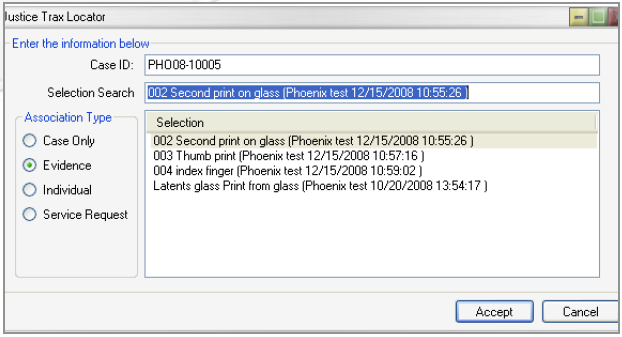 A search can be run against any of the following criteria: Name, Title, Notes,Creation Date Range, Modified Date Range, Pre-configured Field Set Data. CaseWorks has built-in mail and request services which allow for simple and effective task management. These services include exchanging messages between users, assigning and tracking cases and backlog analysis. Recipients are notified when a tasks has been assigned and supervisors are notified of the status of their requests. Files and folders can be attached to messages with total security. Templates can be made for common messages and automatic messages can update all relevant parties. This is a very effective tool for managing workflow. CaseWorks allows an unlimited number and variety of reports to be created. Users can build anything from a single image report to a detailed proof sheet. Users can setup reports to include the agency logo as well as any other collected asset information (i.e. date created/printed, user who created the image, case number, etc.) For latent print and other comparative analysis work, reports will automatically print calibrated images at a 1:1 scale once they are calibrated. Schedule an online demonstration to learn more about Caseworks DEMS!